On this Saturday 19th January, we held solidarity vigils in three cities, in honour of those imprisoned in foreigners internment centres (CIE). Barcelona, where it has been converted in a flagship event; Madrid, which for its second year has partaken in silence and prayer; and Seville, where it was organised for the first time. In these three cities, the entities that make up the SJM (Jesuit Migrant Service) Network (Fundació Migra Studium in Barcelona, Pueblos Unidos in Madrid, and Asociación Claver in Seville) have taken part in organising the events. Some 200 people came together on Saturday 29th January in front of the foreigners internment centre’s (CIE) doors in Barcelona’s Zona Franca. It was the fifth edition of a prayer vigil organised by Fundación Migra Studium’s (SJM) group of visits to the CIE, and that was supported by some 20 entities. The rally again insisted on the profoundly unjust nature of the CIEs, and warned against the current government’s intention to open new ones. As read in the welcome, CIEs cause needless suffering and are solely designed to humiliate, criminalise and stigmatise the whole migrant population, and attempt to convince the public that only dangerous criminals are deported. In the face of this, the prayer vigil demanded dignity for ‘undocumented’ people, asylum seekers, stateless persons…a dignity that they deserve by the simple fact of being people. The first part of the prayer consisted in reading the testimonies collected by Migra Studium’s volunteers visiting the interment centre. These included the cases of Salah, Mamadou, Ali, Kiri and other anonymous stories. All these witnesses, listened to in silence, at the very doors of the CIE, resounded with pain, dignity and determination. “I’ve always acted on the ‘right path’. I learnt it from my parents and my religion. That’s why I feel so ashamed to be in prison” says Salah, who had lived in Lleida for almost 20 years, and who was deported to a country he no longer had any relation to. Or Kiri’s voice: “we arrived in a world of empty words: welcome, bienvenido…words that clothe injustice with kindness. My life after arriving was solitary, always awaiting the risk of being deported.” Or the drama of a boy from Guinea Conakry, who lost his younger brother on the way. In the second part of the prayer, religious texts from the Bible and the Quran were read. The prayer ended with a reading of the Gospel (Matthew 25:35) “For I was hungry and you gave me something to eat, I was thirsty and you gave me something to drink, I was a stranger and you invited me in”, lighting the candles and reciting the Lord’s Prayer. The coldness of the sunset, the coldness of the walls, of the fences and the place’s remoteness made everyone who approached the Zona Franca become aware of one of the many black holes of injustice and suffering that our world has generated. From this coldness, however, a unanimous cry arose: No more CIEs, no more needless suffering. 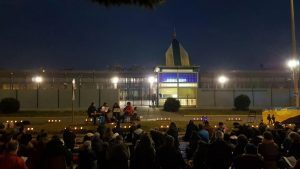 Last Saturday 19th January, the Centro Pueblos Unidos-Fundación San Juan del Castillo and the SJM (Jesuit Migrant Service) organised for the second year the solidarity vigil in honour of those imprisoned in CIEs, entitled ‘No Más CIE’ (No More CIEs). 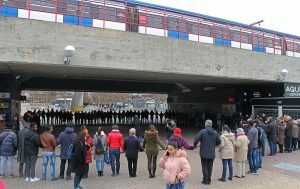 Some 80 people gathered in the square at Aluche metro station, very close to the site’s location. Social entities of the Church grouped in Madrid’s networks of Migrantes con Derechos(Migrants with Rights) and la Mesa por Hospitalidad (Table for Hospitality) took part. During the act, a positioning of the entity was read to encourage the closure of these centres and seek alternatives that better respect human rights. They insisted on the injustice of imprisoning people who have not committed a crime in these centres, that, “in practice, operate as prisons”. A group of African musicians with past experiences at the border and at CIEs, and users of Pueblos Unidos, entertained at the event by performing songs of reflection on the relationship between Europe and Africa and on the inhumanity of the centres. Many people closeto Pueblos Unidos participated in the different readings, including Iván Lendrino, director; José Luis Segovia, vicar of the Pastoral Social Madrid; or Brígida Moreta, manager of Baobab. Poetry was recited and various testimonies of inmates were also read. Finally, there was a shared moment of silent prayer while people lit candles in honour of those deprived of their freedom. Despite the cold morning in Madrid, many people came together to share a common cry: we do not want any more CIEs. 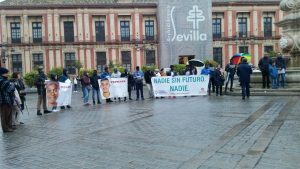 On Sunday, 19th January in the heart of Seville (Plaza Virgen de los Reyes, back of the Cathedral of Seville) the Círculo de Silencio (Silent Circle) and the No Más CIE (No More CIEs) Prayer Vigil took place, despite a permanent drizzle falling almost all day. This act promoted by the SJM in Seville, in collaboration with La Delegación Diocesana de Migraciones (Diocesan Delegation of Migrations), thanks to the involvement of priest Joaquín Castellón, had the support of various organisations, including Cáritas Diocesana de Sevilla and its shelter house Proyecto Nazaret (Project Nazareth), as well as members of HOAC Seville, various parishes such as La Santa Cruz and religious congregations like las Hermanitas de Asunción. It read the No más CIE position prepared by the SJM, and urged that no new CIEs be opened in Andalusia, which already houses two CIEs in Algeciras and Tarifa. It also called for an end to this institution, being a source of rights violations and needless suffering. Finally, there was a Peruvian musician who played Leonard Cohen’s ‘Hallelujah’ in pan flute and sang the poem song ‘Desde el otro lado’ by José Antonio Delgado Millán.